So far, I’ve shared my experiences with the Arm & Hammer Spinbrush Pro as well as tips for a more effective oral care routine. One of the things I love most about the Spinbrush Pro is that I’m able to use less toothpaste without sacrificing my teeth. That and the twice-daily mouth massage I get make this an investment I can feel good about! 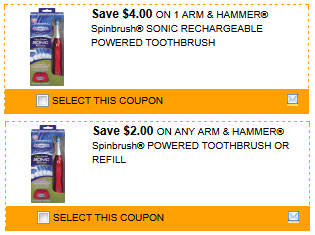 If you’d like to try it for yourself, print a $4/1 Arm & Hammer Spinbrush coupon or a $2/1 Arm & Hammer Spinbrush Refill coupon at Spinbrush.com, plus find $14 worth of additional savings in the Arm & Hammer savings center! Next PostQuestion of the Day: How Do You Feel About the Dentist?